If you are looking to be a receptionist then you will usually have some previous experience in this area and have good communication skills. 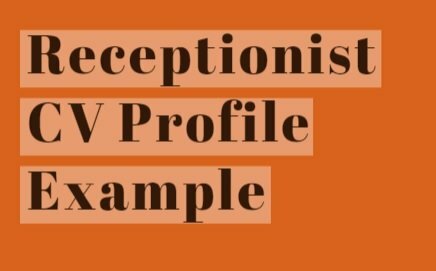 In most companies the role of receptionist does much more than just answering the phone. You could be involved in dealing with the post, being first point of contact for all visitors, be responsible for the meeting rooms and meetings taking place etc so it is important to be aware of this and having good communication skills is key. Employers will be looking for an excellent telephone manner and someone who is very professional in their work as well as someone who is very organised and pays great attention to detail in their work. I have a professional manner in my work and have got a solid background in customer service and providing customers with advice and support mainly over the telephone. I enjoy dealing with new people and like them to go away feeling that they have been dealt with well and efficiently. I have had some telephone/switchboard training and I feel that I have a very efficient manner about the way in which I work. I have a generalist background so am familiar with other duties in general admin and I am happy to do this as part of my role as I like to be kept busy and like to learn new skills. I have previous experience in meeting and greeting visitors, ensuring that they follow our health and safety on their visit by signing in and out of the building. I am used to responding to general queries that are sent in via email and letter and like to get back to people promptly. I am thorough and organised in my work and always ensure that the reception area is left clean and tidy ready for visitors coming into the business.